Every southbound car entering Brighton’s central avenue will be squeezed into a single lane of traffic this summer. Two years of roadworks to redesign traffic flow and pedestrian access around Valley Gardens will begin as early as June. The decision to start digging up one of the busiest roads in the city during the tourist season was criticised by tourism experts, traders, residents’ groups, public transport pressure groups, taxi companies and unions. Critics have predicted “chaos” and “gridlock” and raised the spectre of tailbacks radiating far beyond the centre of the city. The council said disruption would be mitigated wherever possible. Meanwhile the roadworks surrounding the Shelter Hall development at the foot of West Street will not finish this summer as planned but will continue until at least next autumn. That development is now projected to cost twice its original £10 million budget, and the council is working on ways to come up with extra money from its own tight resources as well as from central Government. 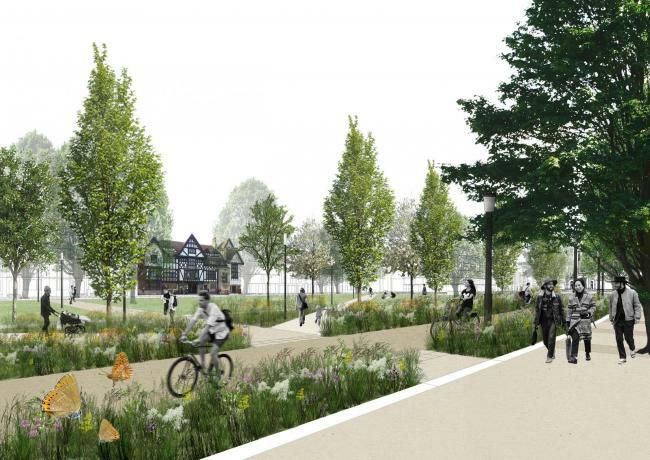 On Tuesday 6th February, a meeting of the Greater Brighton Economic Board confirmed work on the £11 million Valley Gardens scheme would begin in June, although yesterday a Brighton and Hove City Council spokeswoman said it “hoped” to start work on the highway “towards the end of summer”. The first phase of the scheme will include closure of one of the two southbound lanes of traffic on the eastern side of Victoria Gardens from near St Peter’s Church. The Valley Gardens development seeks to open up the several, underused green spaces in the centre of the city from St Peter’s Church down to Old Steine. At present the route is a one way system with two lanes running north, and two south. Once the redevelopment is complete, private vehicles will be restricted to the east of the gardens, with one lane northbound and one lane southbound. On the west, a much quieter road will carry just buses and taxis, northbound and southbound. Extra crossings, extra cycle lanes, and extensive planting and landscaping will make the area easier to access and enjoy on foot. Yesterday the council said work and diversions would be well publicised and the main route would only occasionally be subject to complete closure. The scheme – originally a Green idea – has cross-party support so opposition politicians have focused on whether the Labour administration will make it happen efficiently. Green Party spokesman Councillor Pete West said: “My concern is the Labour administration can’t deliver this competently – their project management is not good. The Valley Gardens scheme is expected to take around two years. This entry was posted in Business, Environment, Public Transport, Road safety and tagged Valley Gardens on 08/02/2018 by srraadmin. Profound concerns about the Valley Gardens redevelopment scheme are revealed in a leaked document prepared by Brighton & Hove Buses. This entry was posted in Communications, Traffic and tagged Environment, Traffic, Valley Gardens on 31/07/2015 by srraadmin. The Mazda fountain has been granted a last minute reprieve as part of Labour’s review of the Valley Gardens revamp. More than a thousand people signed a petition started by Brighton journalist and mum Sarah Booker-Lewis after she read about it’s proposed removal on Brighton and Hove News. One of the first things council leader-elect Warren Morgan did when his part became the largest group on the council was to review the revamp of the roads from St Peter’s to the Old Steine. The Labour group expressed serious concerns about the financing of the scheme in the run-up to the election, saying the cost estimates were over-optimistic and the council was committing to what could become a money pit. But because the decision to go ahead has already been made, and £14m of Government funding secured, it’s now too late for them to stop the scheme. Instead, some changes have been made, including saving the Mazda fountain. 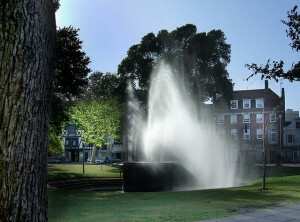 Mrs Booker-Lewis said: “I am delighted the Mazda fountain will stay in Victoria Gardens. Removing it would upset thousands of people. “The previous Green administration, with support from the Conservatives, has allowed the Valley Gardens scheme to progress to an advanced stage. Despite our reservations, we will now make sure that we take into account fully the concerns of the local residents as the final designs of the scheme are developed. In order to make sure that the scheme will be delivered on time and on budget, we have asked for the most senior people at the council to take charge of the project. In addition, we will consult closely with key stakeholders, such as the bus companies and the police. It is clear that the previous administration had not given the project the focus it requires. “The Government have given the council £14 million for this project. Returning the money to the Government has never been an option as this would mean that we would jeopardise investment for future projects. What we have to do now is reshape the project as much as we can without giving up the funding. – Make sure the final designs keep traffic flowing at peak times, especially at junctions. – Make the design fit with the growing Brighton and Hove of the future. – Put the most senior people at the council in charge of the project to minimise disruption. – Save the Mazda Fountain. – Make sure that the final phase of the project is changed so that it brings the maximum benefit to the seafront. Coun Morgan said: “The next five years will see an unprecedented amount of new development in the city as disused brownfield sites are regenerated and the building of the new hospital gets underway. At the same time our transport infrastructure and seafront needs investment and renewal. Our challenge will be to deliver the projects that will take the city forward while keeping it on the move. This entry was posted in Communications, Environment, Planning and tagged Brighton and Hove City Council, Environment, Mazda Fountain, Open Spaces, Traffic, Valley Gardens on 22/05/2015 by srraadmin.